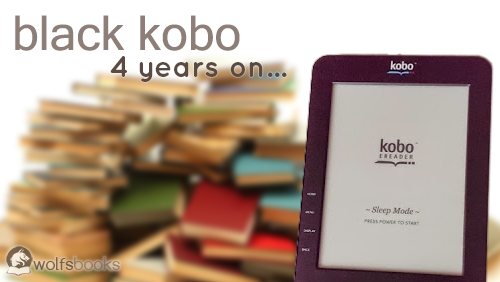 It's been four years since I reviewed my first e-reader, a black Kobo e-ink e-reader. In that time I have had a few more firsts in this area. Continue on after the jump to see how I fared. It's been four years since I reviewed my first e-reader, a black Kobo e-ink e-reader. In that time I have had a few more firsts in this area. My first smart phone and my first iPad, both of which I immediately downloaded the Kobo e-reader app, so that i could continue on in the Kobo ecosystem. The Kobo app allows you to read an e-book you purchased on the Kobo on-line bookstore across multiple devices. So, in theory, I can start reading the new Kevin J. Anderson book 'The Dark Between The Stars' on my iPad app and then continue on where I left off, at work the next day on my Android phone app. This works great on devices connected to the Internet, but in order to update my trusty ole black Kobo e-reader I have to connect it to my PC, via a USB cable, open up the Kobo software and wait for the bookmarks to be updated. In the four years since I have purchased my black Kobo e-reader, Kobo has released several new versions of the original e-reader, all of which include Wi-Fi capabilities, which allows for instant update of your place in your books. When I purchased my Kobo e-reader there wasn't much diversity in e-ink e-readers it was either Kobo or Kindle (available in Australia). 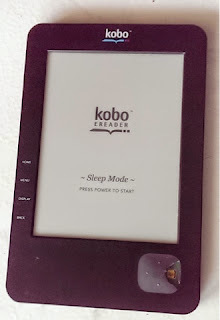 I chose Kobo because it used the universal epub format to store e-books, which gave more choices on where I could purchase e-books and on what devices I could use. After four years, two smart phone and one iPad, I still used my black Kobo e-ink e-reader. Well, up until two months ago when it became a little difficult to move forward in the story (see picture). 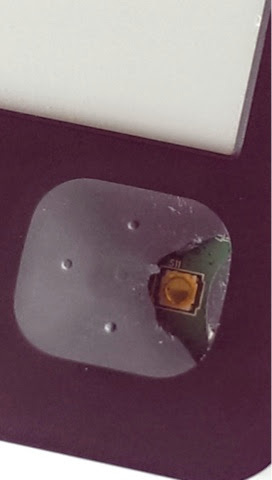 I was looking for spare parts, or a replacement on ebay but have not been successful yet. Even though I use my Android phone and my iPad, I still enjoy the e-ink screen, as it is much easier to read outside and in brightly lit rooms. There is a lot of glare in the break room at work which makes using an iPad to read a bit difficult, so I always returned to the Kobo e-ink screen so I could read in the break room or outside in the sun. Looking at the 'Cons' list from my original post I mentioned the Kobo PC software, that I used to download and load my purchases onto the Kobo e-reader, was a bit buggy. Over the years it has had many updates and patches and has improved significantly. I now only use the official software to download and load my purchases from the Kobo on-line Bookstore, and update my bookmarks. I haven't noticed if the Kobo PC software still downloads all the e-books in their entirety, I usually connect and walk away now. My go-to software for getting e-books/e-pubs purchased from other publishers on-line bookstores is still Calibre, it too has improved over the years but has always been easy to use. I highly recommend that piece of software. I have not had any further issues with my black Kobo e-reader since I last posted about it, so there has been no need to factory default it. I have only had to contact the Kobo Help Desk once since then as well. This was to request a merge of two accounts into one, which happened quickly and effectively with no need to do anything other than fill out the request web form and wait a few days for it to happen. So I have nothing bad to say about the service I received from the Help Desk, my satisfaction rating for them has increased as well. All up I have really enjoyed using my black Kobo e-ink e-reader, and if I can repair it , will continue to use it, even in this age of smart phones and iPads. The e-ink technology sets it apart from the other devices with regular screens in that you can read for longer periods of time with out getting eye strain or worrying about battery life. The only downside is that unless you have a light attached, you can't read it in the dark*, then again that is a limitation for a regular paperback book as well. *The newer Kobo e-reader models all have a back lit screen in order to be able to read it in the dark.